A 50-plus information day held in Broadstone proved a huge success with 200 people visiting the Royal British Legion. Some were attracted by town crier David Squire whose loud voice rang out prior to the start, advertising the event. 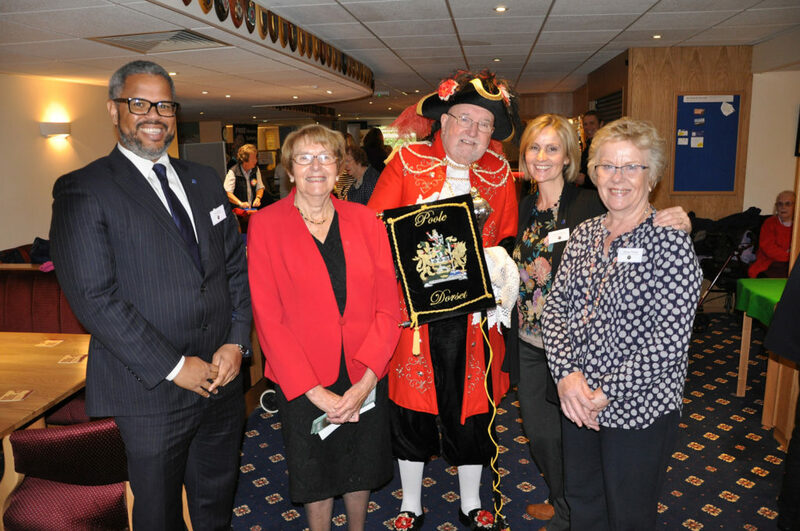 Organised by Douch Family Funeral Directors in partnership with POPP (Partnership with Older People Programme), the information day was opened by Dame Annette Brooke the former MP. She urged everyone to visit the stands and, brandishing a handful of leaflets, said she had already been round. There were dozens of exhibitors offering advice and products, from mobility scooters to sport. There were also cooking demonstrations and free refreshments. Emma Regan from Douch Family Funeral Directors said: “We often find that when someone is bereaved there are everyday things that their partner looked after that they have to pick up. “When they are in mourning it is often a difficult thing to do. However, our 50-plus event showcased what help and support is on offer. “One lady I spoke to was recently retired and lived on her own. “She was unsure how to fill her time but came along and on the back of visiting the event she has filled over 14 hours of her time with clubs including ‘knit & natter’ sessions and bowling. “We’re very grateful to everyone who exhibited and for all those who came, and especially for Dame Annette Brooke for opening it.